Queensland Senator Malcolm Roberts attended the Toowoomba gun show today, 27 May 2017. Senator Roberts, who has been a staunch advocate of the rights of law-abiding Queenslanders to own firearms, said today that “One Nation is absolutely opposed to efforts to undermine this crucial freedom. “However the big disappointment is the Liberal-Nationals. While the National Party in the days of Sir Joh strongly supported the rights of gun owners, the latter day Liberal-Nationals appear to have little sympathy for them, having introduced draconian gun laws under the previous Newman- Nicholls government such as mandatory jail terms for as little as possession of an unregistered air rifle, which is simply a child’s toy”. “The basic problem seems to be an assumption by all the major parties that everyone is equally likely to commit a crime” the Senator observed. “However, trying to prevent the actions of a criminal minority by punishing everyone indiscriminately is ludicrous”. 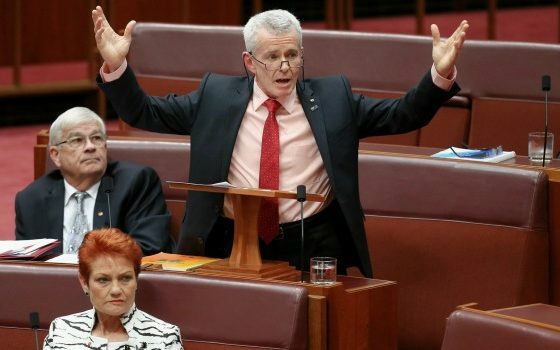 Senator Roberts then went on to highlight that Pauline Hanson’s One Nation is “all about individual freedom and responsibility”. ”Unlike Labor, the Greens and the Liberal-Nationals, One Nation will continue to advocate and support the rights of law-abiding Queenslanders and to oppose legislation that erodes the inalienable right to own firearms”, Senator Roberts said. Senator Roberts also met with the One Nation candidate for North Toowoomba, local man Paul Wilson. Senator Roberts said he enjoyed meeting with and supporting such an upstanding individual – Mr Wilson being named as the Toowoomba Regional Council, Toowoomba Regional Citizen of the year and nominated for Australian of the year. Public health lobby prescription: gun control did nothing, triple the dose!